HYCM is a leading online provider of forex and Contracts for Difference (CFDs) trading services for both retail and institutional traders. CFDs are derivative securities that allow customers to gain exposure to the price of financial instruments without actually holding the instruments in their accounts. HYCM offers trading in CFDs on forex, metals, indices, oil and gas, soft commodities, stocks and cryptocurrencies. Traders can take comfort in the fact that HYCM has a more than 40-year history of offering financial products and services to the trading community. Traders seeking a stable, well-regulated broker that offers its customers access to over 100 forex and CFD products should check out HYCM. Please remember, while HYCM is a responsible broker, losses can still exceed deposits. CFD trading is for experienced traders. 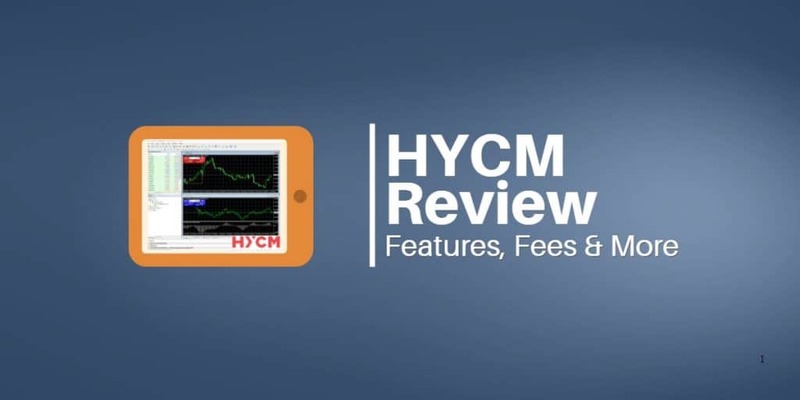 This review of HYCM will cover all of the important details about the broker and discuss its major advantages and disadvantages. HYCM is a division of The Henyep Group, which is a global corporation with businesses in Asia, Europe and North America. The group was founded in 1977 as Henyep Gold Dealers and became a member of the Hong Kong Gold and Silver Exchange Society. The group soon created divisions Henyep Securities and Henyep Commodities and expanded its trading in Asia. By 1980, Henyep set up a branch in New York and was later approved as a member of the Commodity Exchange of New York (COMEX). Throughout its history, The Henyep Group has shown a keen interest in building sophisticated products and trading technology. In 2000, Henyep Investments pioneered CFD trading on energy and commodities and launched an online stock trading platform, Hotrade. The company launched its second generation online trading platform HY Trader 4 in 2006 and its highly touted HY Markets Online platform in 2007. In 2016, Henyep consolidated its capital markets investment brands and launched its multi-platform online trading website HYCM.com. HYCM has its headquarters in London, United Kingdom and an operational office in Limassol, Cyprus. The company also has a physical presence in Hong Kong and Dubai. Henyep Capital Markets (UK) Limited is authorized and regulated by the Financial Conduct Authority (Company reference number 186171). HYCM offers customers dedicated 24/5 customer support in multiple languages. Traders can contact HYCM customer service by phone, fax, email or live chat or directly through the company’s worldwide offices. Traders can view the HYCM website in English, Spanish, Arabic, Italian, Russian and Chinese. Yes, HYCM is a trustworthy company that has been operating for over 40 years and is regulated in multiple jurisdictions. HYCM is a safe and secure way to trade forex and CFDs. The company and its subsidiary are regulated by the Cyprus Securities Exchange (CySEC) and the Financial Conduct Authority (FCA). Cyprus is a European Union member and is a financial services industry hub. Customers in countries regulated by CySEC are eligible for compensation of up to €20,000 if HYCM fails. HYCM’s CySEC License Number is 259/14. The UK’s Financial Conduct Agency (FCA) regulates HYCM’s activities in the UK. The FCA is widely respected as a leader in financial regulation. In addition, the UK scores highly in Transparency International‘s rankings of countries based on their corruption perceptions index meaning the UK is a pillar of anti-corruption. HYCM customers in the UK are protected by the UK based scheme Financial Services Compensation Scheme (FSCS), which was established to protect consumers when authorized financial services firms fail. FSCS pays compensation up to £50k to customers in the UK if HYCM is unable to pay. HYCM’s Financial Services Register reference number is 682782 (Henyep's is 186171). As for cybersecurity, traders can feel secure using the HYCM platforms. The broker has implemented state-of-the-art technology and detailed processes to handle key areas such as user authorization, data protection and network communication. The Henyep Group, the company that operates HYCM, is a privately held company. Stavros Lambouris is the CEO International of HYCM. HYCM divides the products it offers to traders into seven categories: forex, metals, indices, oil and gas, soft commodities, stocks and cryptocurrencies. The broker offers three types of trading accounts, and some of the products listed below are only available to holders of Standard and VIP accounts. The underlying financial instrument and the type of account determine the HYCM spreads that traders pay. HYCM obtains the data from reputable third-party sources, which obtain the data directly from exchange feeds. HYCM receives its compensation through the market bid/ask spread. Commission Fees: HYCM does not charge commissions to clients. Rather, the company receives its compensation through the (bid/ask) spread on each financial instrument. Deposit Fees: The broker does not charge deposit fees to clients. Withdrawal Fees: HYCM has six methods for withdrawing funds. Withdrawals by Visa, WebMoney, UnionPay Neteller and Skrill are free. Wire transfer withdrawals of less than $300 incur a $30 handling fee. Overnight Funding Fees: This overnight HYCM fee (or credit) is either added to or subtracted from a trader’s account when a position remains open past a certain period of time. Guaranteed Stop Orders: Traders who want to guarantee that their position closes at a specified price may pay wider HYCM spreads to execute these trades. When you click on the red Create Account button on the HYCM platform, the system asks you to pick your country of origin from a drop-down menu. Before you can trade with HYCM for the first time, you need to answer a few questions. You enter your name, email, country of origin and phone number. Then you answer a few questions about your background and financial knowledge. Traders can submit these documents by email, fax, computer upload or mobile device upload. Traders can make deposits and withdrawals by Visa or MasterCard, wire transfer, WebMoney, Neteller, UnionPay or Skrill. Deposits by wire transfer take between 1 to 5 days for processing, while with the other methods, traders receive funds in their account instantly. Depositing money in an account is fast and simple. Traders click on the Deposit Funds button on the main screen. Traders then select the deposit method of their choice, fill in the required information and click “Submit.” The minimum amount required to make a deposit starts at $100 for a Micro Account. HYCM offers different amounts of leverage depending on the CFD product, but the maximum leverage for UK and EEA clients is 1:30 and for the Rest of the World it is 1:200. Traders should consult the HYCM website for specific leverage allowances for each product. Each CFD also has specific HYCM margin requirements that traders must maintain. Traders who fall below the HYCM margin requirements risk receiving a margin call and having their position closed prematurely. Withdrawing funds from your HYCM account is easy and straightforward. HYCM has withdrawal minimums depending on the method of withdrawal. For withdrawals to credit and debit cards and eWallets, there is a $20 minimum. The minimum withdrawal amount for a wire transfer to a bank account is $250. When making a withdrawal, HYCM transfers your funds back to the original source you used to fund your account. In some cases, if they can’t refund the excess profits back to the original source used to fund the account, they will transfer the funds to your identified bank account. This account needs to be in the same name as the account maintained with HYCM. HYCM charges a $30 withdrawal fee on wire transfers of less than $300. HYCM may require copies of your credit card before approving a withdrawal request. Traders should consult the banking section of the HYCM website for more details. Customers should consult the Deposits & Withdrawals section of the HYCM website for details about withdrawal times. HYCM processes all withdrawal requests within a day of receiving them. However, depending on the final destination of the withdrawal, it may take up to seven days for funds to arrive. HYCM offers traders two good platforms for trading. Traders can choose Prime Trader, which is HYCM’s state-of-the-art proprietary multi-asset platform, or they can go with the very popular industry standard MetaTrader4 (MT4) platform. They can also trade on the go using the HYCM mobile app. This review will cover the MT4 platform. The MT4 platform is a well-designed platform with excellent features for more experienced traders. Logging in to the HYCM MT4 platform is simple and straightforward. The overview page directs you to the download link and the setup window. The download is very quick. Once traders agree to some standard disclosures they can click the MT4 icon on their desktop and be on the platform in minutes. Market Watch Panel: This panel contains the live prices and symbols of popular instruments traded on HYCM. Chart Window: This large panel in the middle of the screen displays the historical prices, technical indicators and charting tools used to create price charts. The chart window opens with four charts, and traders can customize and configure each of these charts with unique indicators and technical analysis tools. This feature is particularly nice for two reasons: 1) It allows the trader to look at four charts for different instruments or different timeframes at the same time, and 2) it has a built-in ticket feature that allows traders to click on the price and instantly send an order to buy or sell. Traders can also right-click on any part of the Market Watch panel to get a list of useful data points such as high-low prices, depth of market and tick chart. If you click on the chart window choice, then a new chart will appear along with the four charts that populate the window upon opening it. When traders click on any of the other data points, the information appears in the Market Watch panel. 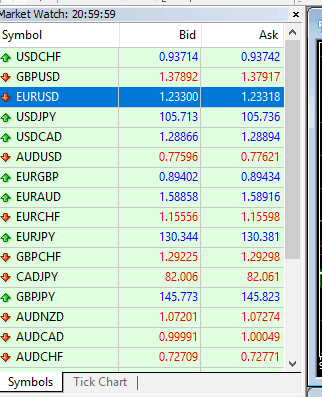 Traders also have the ability to right-click on a symbol and pull up a tick chart for a particular instrument. 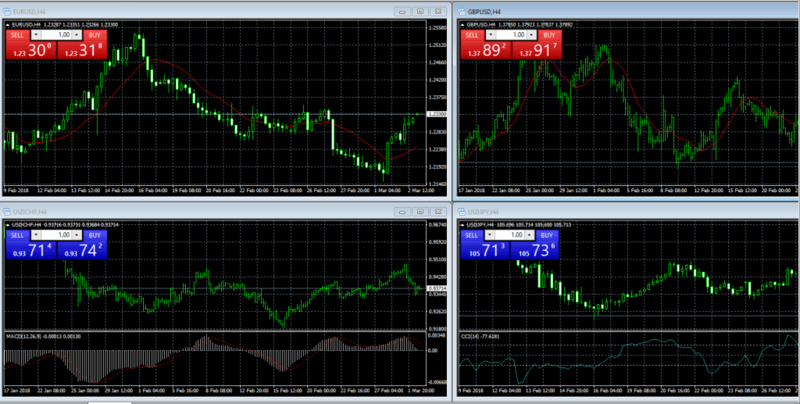 The Chart Window has some great features that make the MT4 platform stand out from more basic trading platforms. Traders can access their open orders and a ticket window by right clicking on a specific chart. They also can change the timeframe, perspective and colors of a chart. With the window tab at the top of the platform, traders can organize the charts in cascade, horizontal or vertical format. Active traders that like to keep multiple charts open at once are certainly going to find these features attractive. 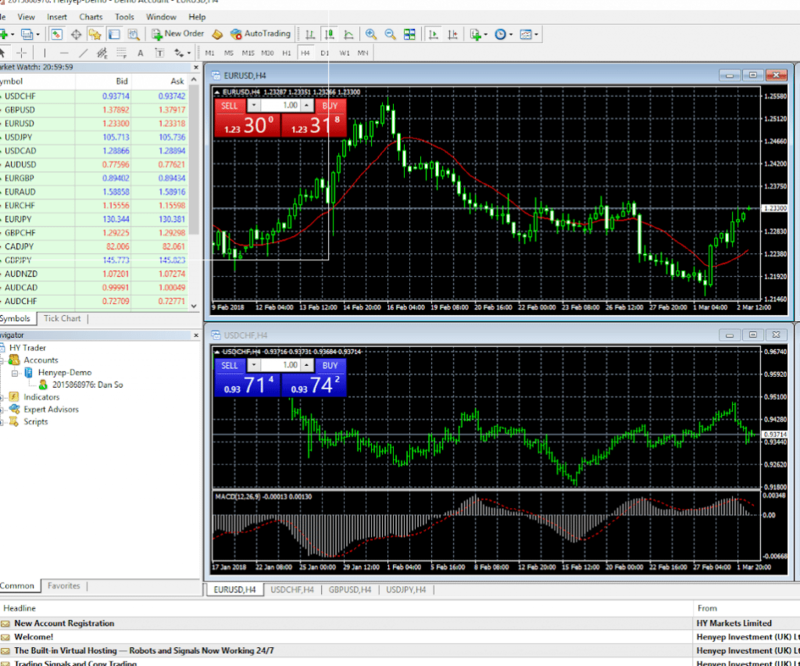 Overall, the charting features of HYCM’s MT4 platform are excellent although a bit complicated to learn. The standout feature of the charting on MT4 is definitely its ability to display multiple charts with different indicators at the same time. Terminal Window Panel – This panel shows the trader’s active, pending and closed trades. This panel is also where the trader can configure alerts and monitor the platform’s important trading and system messages. The top menu on MT4 has a help section that contains documentation, video tutorials and other guides to using MT4. This resource will be especially useful to new traders. The robust functionality, especially as it pertains to charting, make MT4 a superior trading platform. However, it can take a while to learn. Advanced traders will appreciate the dozens of technical charting tools available, but beginners might find it somewhat overwhelming. Traders can open a demo account with HYCM, but it operates as a stand-alone from the live platform. The demo account looks like the live account, and traders get the same functionality. HYCM has an education section on its website that offers a variety of tools for learning about HYCM markets and trading. Trading Tools: This section has video courses on topics such as The World of Global Trading, Capital Management and Trading Psychology. Beginners' Courses: A section devoted to video courses on basic topics such as Basic Forex Terms and Types of Orders. Tutorials: This section contains videos on more detailed topics such as how to add indicators to graphs and using more complex orders. Trading Strategies: This section covers in-depth advanced charting strategies such as trend signals, fractals and Fibonacci sequences. eBooks: Covers the asset classes traded on the platform. Because HYCM is regulated within the EU, it is unable to offer sign-up bonuses or promotions due to the Markets in Financial Instruments Directive (MiFID). This has been introduced across the EU in order to protect traders with a more transparent approach to markets. However, HYCM does offer a 10% Credit Bonus for all deposits made over $100 (to a maximum of $5,000). Applicable only for HYCM Ltd.